Caroline Mesquita, The Ballad 2017. Digital video with colour and sound, 29 minutes. Courtesy the Artist and 221A. Photograph by Dennis Ha. 221A is pleased to present The Ballad, a solo exhibition of new work by Caroline Mesquita, curated by Martha Kirszenbaum and created during a residency in Vancouver this winter in partnership between 221A and Griffin Art Projects. Caroline Mesquita’s sculptural practice intertwines the materiality of her altered, oxidized, and painted copper and brass sheets with theatrical playfulness. 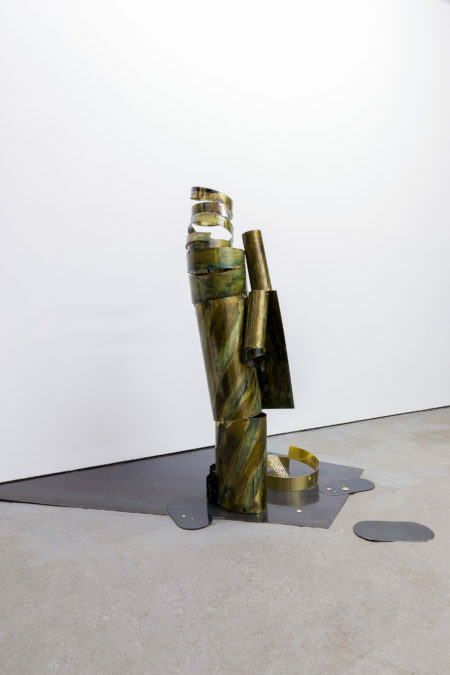 Her metallurgic experiments result in life-size figures, interacting with each other in a mise-en-scène crafted from sculpted sheet metal and an environment of coated steel. For the exhibition The Ballad, Mesquita produced a series of four sculpted characters interacting and facing each other or the viewer, as their presence blurs the line between fiction and reality, humans and mannequins. It is a procession, a form of public celebration, a moment of communion. There is a distinctive boldness in Caroline Mesquita’s gesture and approach to the material and the object as she transforms rough pieces of metal into a sophisticated ensemble of colored sculptures forming a joyful parade of dancing souls. 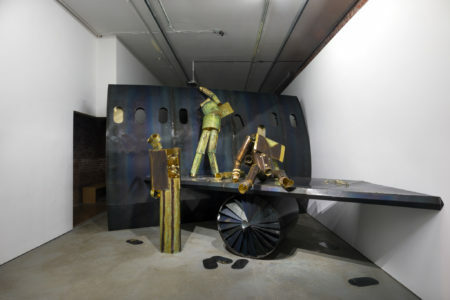 The structure of the exhibition is framed by large pieces of dark gray steel, evoking a fuselage, a wing and the jet engine of a dislocated plane, as if it had crashed in a faraway desert zone, providing the metal characters—perhaps the plane’s passengers—a backdrop or playground made of its leftover fragments. 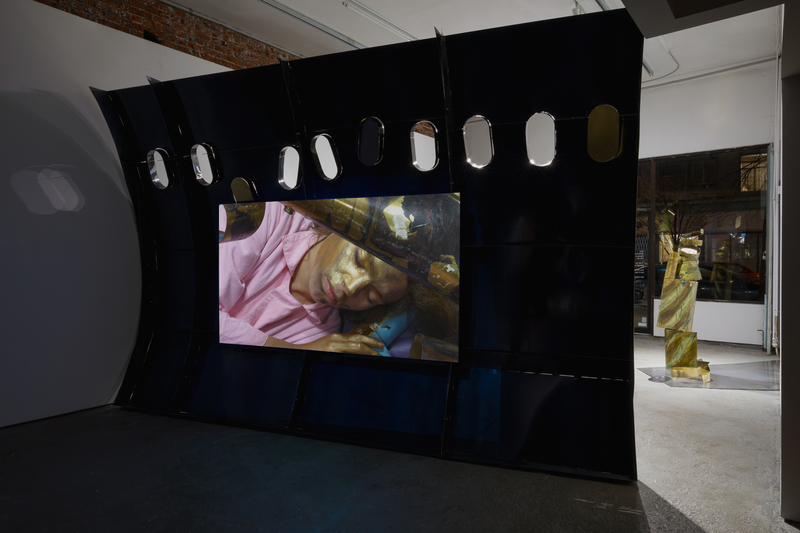 In the video produced for the exhibition and titled The Ballad (2017), the artist appears alongside her sculptures, as she pushes and reinvents ways of living together. Masquerading as a myriad of characters with diverse costumes and makeup, whether personifying a pilot, a teenager with braces, or an elegant Gothic woman, she seems to challenge our understanding of identity construction and representation, oscillating between tenderness and violence, love and vice. As her sculptures cuddle and caress her, then attack and wound her, the soundscape of the video—metallic jingling and clinking—gives the impression of a deliciously perverse carnival. The first chapter of the project was hosted at the Fondation d’entreprise Ricard, Paris, earlier this year. The exhibitions will dovetail into an artist’s book published later in the year. Supported by the Cultural Services of the Embassy of France in Canada, Institut Français, Paris and Griffin Art Projects, North Vancouver. With thanks to Dylan Townley-Smith, Wesley Horsfall, Stephan Wright and Ian Rhodes for your assistance in the studio. Excerpt from Caroline Mesquita’s The Ballad, 2017, digital video, 29 min. Courtesy the Artist, carlier | gebauer, Berlin and Union Pacific, London. Produced by Fondation d’entreprise Ricard, Paris and 221A, Vancouver. Exhibition view of The Ballad, Caroline Mesquita, 2017. Courtesy the Artist and 221A. Photograph by Dennis Ha. Caroline Mesquita,The Green-dressed Woman, 2017. Oxidized brass with resin, 172 x 47 x 29 cm. Courtesy the Artist and 221A. Photograph by Dennis Ha. Caroline Mesquita, The Co-pilot, 2017. Oxidized brass with resin, 129 x 69 x 69 cm. Courtesy the Artist and 221A. Photograph by Dennis Ha. 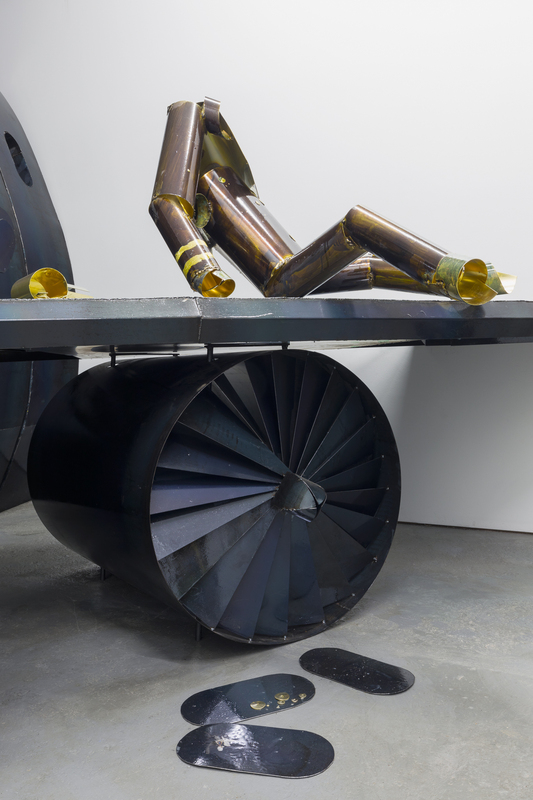 Caroline Mesquita, The Mechanic 2, 2017. 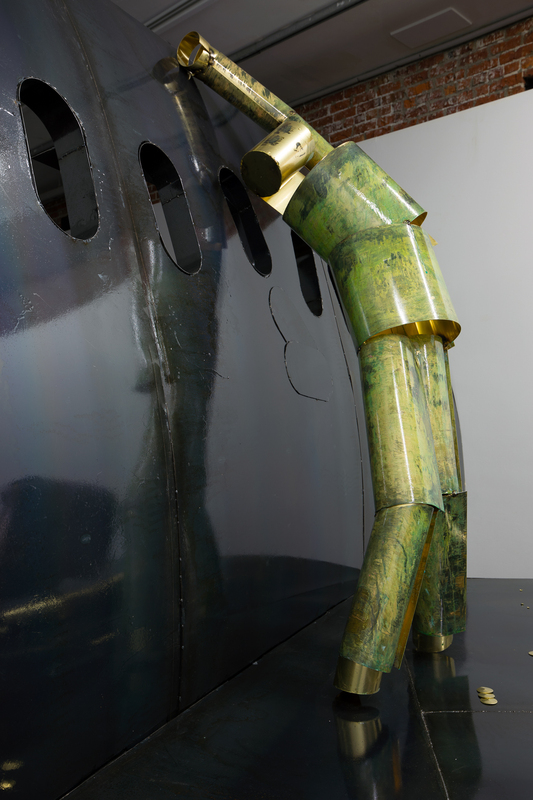 Oxidized brass with resin, 173 x 76 x 33 cm. Courtesy the Artist and 221A. Photograph by Dennis Ha. Caroline Mesquita,The Ballad, 2017. Digital video with colour and sound, 29 minutes. Commissioned with the support of Fondation d'Entreprise Ricard and 221A. Courtesy the Artist and 221A. Photograph by Dennis Ha.